Miles and miles of quiet roads and tracks criss-cross the peninsula from Beauly and Muir of Ord in the west to Cromarty in the east, from the north coast on the Cromarty Firth to the Beauly Firth along the south. Choose a route that suits your level of fitness and time available, and have a great day out. Bike hire is now available from Black Isle Bicycles through The Cheese House Cromarty. Cromarty provides access to quiet coastal roads both sides of the Cromarty Firth through use of the Cromarty to Nigg Ferry. There are loads of forest tracks to explore, and the MTB Trail Centre at Learnie Red Rock is also nearby if you fancy some singletrack adventures. The top quality hybrid bikes will take you on and off road; helmet, lock etc are included. Check Black Isle Bicycles on Facebook , and Highland Ferries for the latest on the Cromarty - Nigg ferry which is a great option for cyclists, opening up some lovely round trips. Browse the 13 village-to-village routes on Transition Black Isle's site for routes along quiet roads and forest tracks between the Black Isle's beautiful communities. 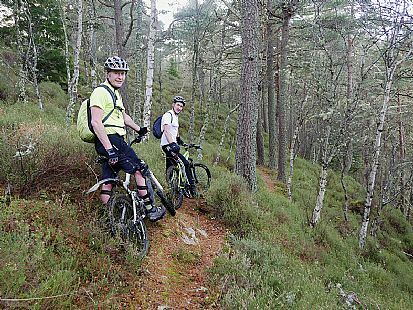 And below are some suggested routes from Black Isle Bicycles - visit their site for advice and printable route maps. Start at the beach, bowl along beside the sea to the lighthouse at Chanonry Point and look for the famous dolphins, scoot back for an ice cream at the beach café. Admire the beautiful Celtic mosaic there, and add in a lovely walk to the waterfall at the top of the Fairy Glen, an RSPB reserve. Perfect for a family day out. Around a mile’s cycle each way. Just across the Kessock Bridge from Inverness you’ll find the seaside village of North Kessock. Cycle along the shore road to Redcastle (yes there is a castle! ) and spot medieval fish traps, a Pictish crannog and amazing birdlife and seals. The road is flat and quiet; go as far as you like and retrace your route back to the village when it suits you. It’s around 5 miles from North Kessock to Redcastle. Each letter in the Celtic alphabet is also a tree, and throughout the Black Isle you can visit beautiful mosaics of each letter and its associated tree, folklore, flora and fauna. The mosaics have been created by Groam House Museum working with community groups across the Black Isle. One of the many possible routes takes you from Avoch (mosaics of ailim, pine and quert, apple) to Fortrose (with beith, birch, seille, willow and nuin, ash) along the old railway line path, just a couple of miles on the flat. Cycle another mile to visit Groam House Museum in Rosemarkie, and find out more about the mosaics here. Around 5 miles each way on the flat along the shore, on a main road but relatively quiet.. The new RSPB hide at their Udale Bay reserve is a great place to catch your breath and marvel at the birdlife. Take your binoculars and a bird book to get the most from your visit then refuel back at Cromarty with its great choice of places to eat. Find out how a Cromarty stonemason became a bestselling author and one of the most influential of Victorian thinkers. Hugh Miller’s Birthplace Cottage and Museum in Cromarty, owned by the National Trust for Scotland, gives a glimpse into the life of this fascinating man. See fossils from his vast collection and then make your way to the scene of his inspiration, the beach at Eathie, to find some yourself. Around 4 miles cycle each way, some on a main road, plus a steep walk of a mile each way to the beach itself. Udale Bay to Fairy Glen. Just under 7 miles each way up and over the ridge of the Black Isle takes you between these two lovely and very different RPSB reserves, one a vast bay, the other a shady wooded glen. Mostly quiet roads, with a bit of a climb. Add in the multi award winning Glen Ord Distillery in Muir of Ord at the western end of the Black Isle, and fill up your panniers even more. 23 miles end-to-end mostly on quiet roads and cycle paths. The Black Isle Villages route suggested by VisitScotland takes you on a lovely 21-mile ride round Munlochy, Rosemarkie, Fortrose and Avoch. These villages are packed with history – and some great refuelling options. Mountain biking is for everyone! Try the green routes at Learnie Red Rock to get into the groove, then maybe give the blue trails a go. Our bikes, with hydraulic brakes and front suspension, will keep you comfortable over the bumps. If your confidence is up, maybe try coming down the orange descent from Callachy Hill or go over the road and give the black a go. Distance – as far as you want! Away from the trails, there are miles of forest tracks to explore. Ask us for advice. This 26 mile route takes in beautiful sea and mountain views, archaeological remains including crannogs and fish traps, other fascinating built heritage such as Redcastle Pier and Wardlaw Mausoleum of Outlander fame, rich birdlife, and some great options for the essential coffee and cakes. If you're not sure about doing the whole 26 miles, try sections of the loop such as the beautiful shore road from North Kessock to Redcastle, combine bike and train using the stations at Muir of Ord and Beauly, and explore some off road options and alternative back roads. Stop for sustenance in Muir of Ord (Deas the Baker), Beauly (Corner on the Square, The Priory Hotel, The Old School, The Lovat Arms) or North Kessock (North Kessock Hotel, The White Cottage Tea Room). Check the map here, read a little more here. Many thanks to Highland Council's Carbon Clever Fund and to Muir of Ord Community Council.